Barcelona is Europe’s largest cruise ship port and the city receives more than two and a half million cruise ship passengers every year. Fortunately there are plenty of transport options available to get you from your ship to the city centre as quickly as possible. Which mode of transport you choose will depend on which terminal your ship arrives at, what you plan to see and do and your budget. This article explains the different transfer services which are available and includes useful information to help you make the most of your stay in this fantastic city. 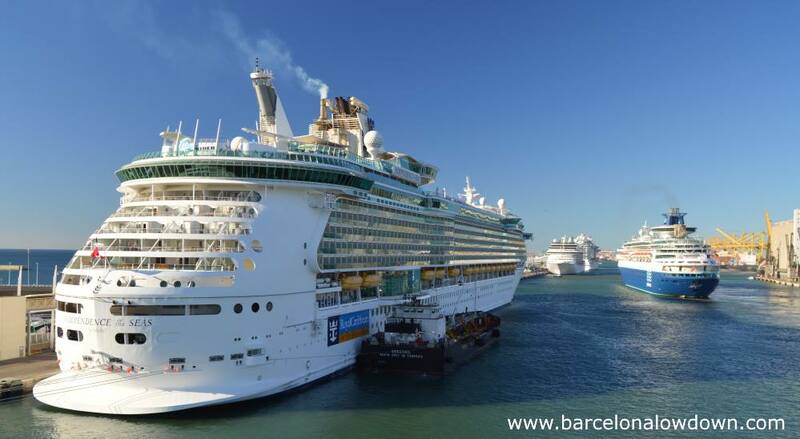 Before deciding which is the best way to get from the cruise terminal to Barcelona city centre you should check which pier your ship will dock at and how much time you will have before you need to return to your ship. This information should have been provided by your travel agent when you booked your cruise. If not you can check the Barcelona cruise port schedule which is linked to on the right hand side of this web page under Monthly Forecast. Barcelona’s cruise port comprises of 6 terminals located at the end of Barcelona’s famous Ramblas boulevard. Two of the cruise-ship piers are located next to the World Trade Centre on the Moll de Barcelona Wharf and can be easily reached by walking from La Rambla and the nearby Drassanes metro stop (metro line L3). The World Trade Centre terminals are called the North and South terminal and are used by smaller cruise liners. Larger ships dock at the Moll Adossat quay terminals (Terminals A, B, C and D). Terminal D is the farthest away of the four quays and is approximately four and a half km from La Rambla and the Columbus monument. There are taxi ranks next to each of the cruise terminals and you can be sure that there will be a long line of taxis ready and waiting when your cruise ship docks. A taxi from your cruise ship to the city centre will cost around €15 depending on which terminal your ship arrives at and whereabouts in the city centre you want to go. 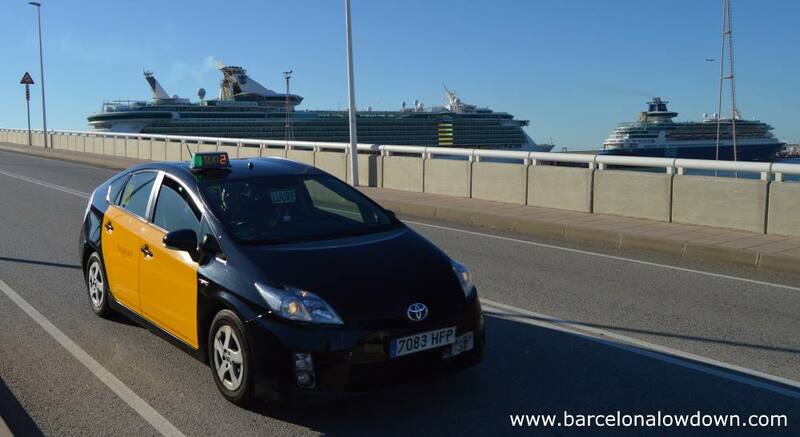 All taxis in Barcelona are metered, there is a €3.10 supplement for a cruise pier pick-up which will be added to the price which is displayed on the meter at the end of the journey. If you have a lot of luggage there may also be an additional charge. You can check the official tariffs here. The distinctive yellow and black cabs also have a sticker displaying the prices on one of the rear windows. The Cruise Bus (also known as the Portbus) is a shuttle-bus which runs between the Moll Adossat cruise ship terminals and the Columbus Monument at the end of the Ramblas. The fare is €3 one way or €4 return and is paid in cash on the bus (coins or small value notes only). The buses don’t have a set timetable instead they are coordinated with the arrival and departure of the cruise liners. In the mornings, when passengers disembark from the ships, buses depart every few minutes. Later in the day, the buses run less frequently so you should check the schedule with the driver and plan your return trip accordingly. 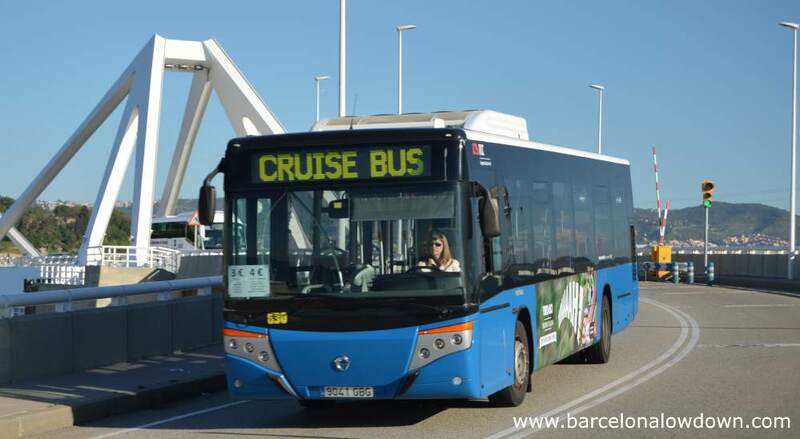 The Cruise Bus is NOT covered by TMB tickets or travel cards such as the T10 or Hola BCN!. The journey from the cruise terminals to the Columbus monument takes about 10 minutes. From here you can start visiting Barcelona on foot since many of Barcelona’s most popular sights such as the Ramblas, the Maritime Museum, the Gothic quarter and the historic Port Vell are close by. Open top city tour buses stop at the Columbus monument and near the World Trade Centre terminals. It’s a short walk from the Cruise Bus stop to the Drassanes metro station which is on line L3. Although there will be plenty of taxis and buses waiting at the cruise terminal, when a large cruise ship docks and thousands of tourists disembark at the same time long queues do form. You can avoid the queues by booking your transfer in advance. A private transfer is more expensive than catching a taxi at the taxi rank but has the advantage that your driver will be there waiting for you as soon as you disembark from the ship. Book your private transfer in advance online. Before you decide to walk from your cruise ship you should check which terminal your ship docks at. The World Trade Center terminals are located on the Moll de Barcelona which is a short walk from the Columbus monument. Walk straight ahead along the quay until you reach the large steel hoops of the Onades monument. Turn right and walk along the Moll de Drassanes until you arrive at the Christopher Columbus monument and the start of Las Ramblas. If you decide to walk into Barcelona from the Moll Adossat quay you should bear in mind that it takes between 25 (Terminal A) and 45 minutes (Terminal D) and there’s no shade from the sun. Follow the road along the pier from the ships (there’s a paved footpath which runs alongside the road). After crossing the Porta d’Europa bridge continue straight ahead along the pier until you come to a small roundabout. Turn right and continue past the Moll de Sant Bertran, the Onades monument and the Moll de Drassanes to the Columbus monument (see map below). From here you can take the metro or bus to other parts of the city. Barcelona’s open topped sightseeing buses have 2 stops near the cruise port. The first is located right in front of the World Trade Centre cruise terminals. The other is located next to the Columbus monument at the end of the Ramblas. The buses follow 3 circular routes, each of which covers a different area of the city. Both of the stops near the cruise port are on the red route which takes 2 hours to complete and is the most interesting of the three since it passes the most emblematic buildings. Tour buses depart every 5 to 25 minutes depending on the time of year. By purchasing your ticket in advance online you can benefit from a €2 discount and board the bus at whichever stop you choose. Important: You cannot take luggage on the hop on hop off tour buses. A popular way to maximize your time in Barcelona is to book a shore excursion. In addition to saving you the hassle of organizing your transfer from the port, being on an organized tour allows you to skip the lines when visiting popular sites such as the Sagrada Familia, Casa Batlló and the Picasso Museum. When you book your shore excursion you will be asked to provide the name of your ship and arrival and re-boarding times. Find out more and book your shore excursion. If you will arrive in Barcelona at the end of your cruise and want to spend a few hours sightseeing before your flight home, you can have your luggage collected from the cruise port and transported directly to the airport for you. Find out more. There are also left luggage storage facilities near to Plaça de Catalunya, Plaça d’Espanya and at Barcelona Sants train station. 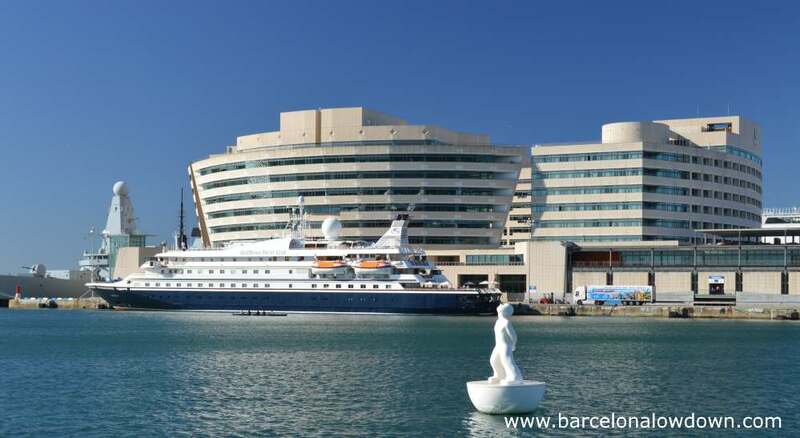 The only hotel at the Barcelona cruise port is the 5 star Eurostars Grand Marina Hotel. If you will be staying overnight in Barcelona before embarking on your cruise, I recommend that you choose a hotel located near the Ramblas. what bus do we take from the Be Ramblas Hotel to the Princess Explorer of the Seas? Do you know which pier your ship will dock at? 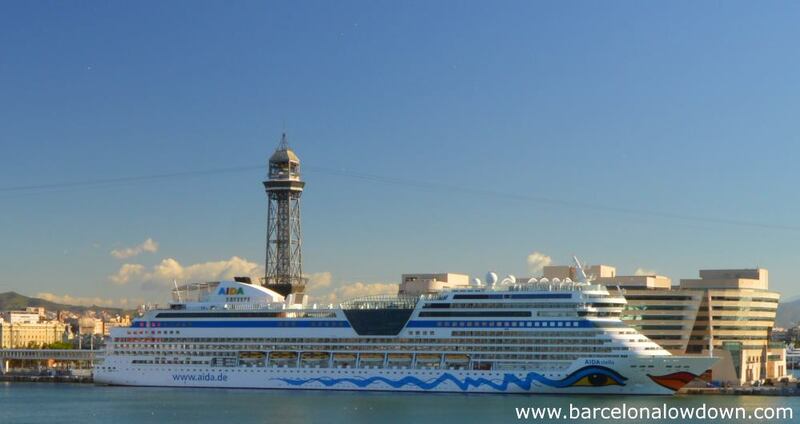 I just checked the 2018 schedule on the Barcelona port authority website (link in the article) and the Princess Explorer of the Seas doesn’t seem to be listed. I expect that it will probably dock at one of the terminals on Moll Adossat but you should check with the company to make sure. Assuming that it docks at Moll Adossat then you can catch the blue Cruise Bus which departs from near to the Columbus monument (see map above). I’m not familiar with the Be Ramblas Hotel. Do you mean the Be Ramblas Hostal at Carrer Nou de la Rambla 50? If so then your hotel is about a 10 minute walk from the Cruise Bus stop.